London-based band Hats Off Gentlemen It's Adequate's new EP, 'Solace'. 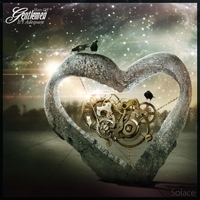 It starts with title track 'Solace'. This prog rock track shows singer/songwriter/guitar Malcolm Galloways love for Pink Floyd and Marillion. Beginning with a spacious but understated guitar solo, followed by a full band section, and with an instrumental coda. The lyrics are inspired by the recycling of atoms in the stars, and how many of the particles that make up our bodies comes from the stars. "As I walk into the sun, carry me, carry me. We are made of space and time and stars. Broken stars. Broken stars, carry me." The song will be appearing on the forthcoming artificial intelligence themed album 'When The Kill-Code Fails". The song is written, performed and produced by Malcolm Galloway. The second track 'My Clockwork Heart' is also from the forthcoming Kill-Code album. It is about a virtual character who has (or at least thinks he has, or acts as if he thinks he has...) developed consciousness. This song is about his acceptance of what he is, and his belief in the substrate independence of consciousness. This track was written by Malcolm Galloway, Ibon Bilbao, and Rudy Burrell. Malcolm Galloway - vocals, rhythm guitar, bass, keyboard, programming, production; Ibon Bilbao - lead and rhythm guitars. The third track is more playful, with a retro feel. It comes at a point in the Kill-Code album where the virtual character has come to terms with his identity, and is confident that he is both alive, and passionate about experiencing life. There are lyrical references to the earlier My Clockwork Heart song. I'm more alive than I've ever been before and I want more"
Music and lyrics by Malcolm Galloway. Song arrangement by Malcolm Galloway and Rudy Burrell. Performed and produced by Malcolm Galloway. The EP ends with Pink Floyd's Comfortably Numb. Pink Floyd/David Gilmour have been a huge inspiration to the band, and Comfortably Numb is featured in most of Hats Off Gentlemen It's Adequate's live sets. This cover is performed by Malcolm Galloway (vocals, guitar, keyboard, programming, production) and Mark Gatland (bass).